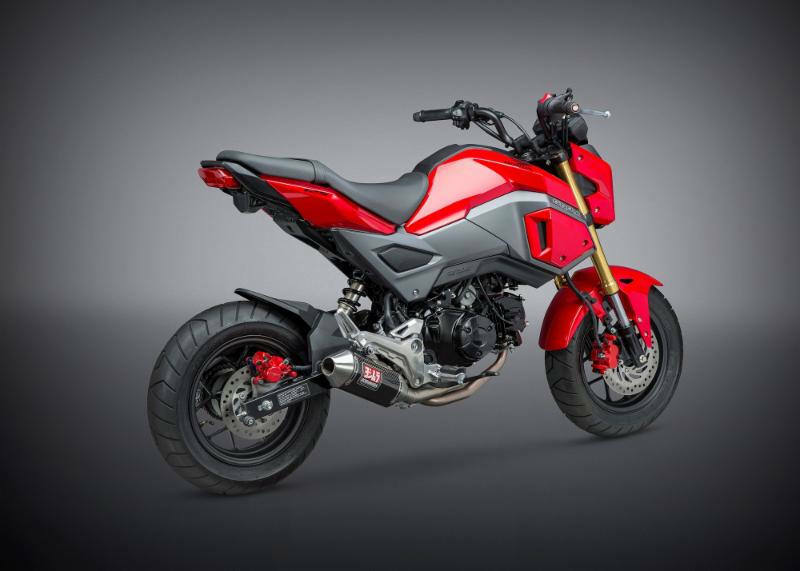 It was only a matter of time before more and more aftermarket companies started hopping on the bandwagon and releasing new exhaust systems for the newly changed-up 2017 Grom 125. Yoshimura teased us a couple of months ago with this picture (below) that they posted on Instagram, Facebook etc. At first, I was disappointed as it looked like they were just going to use their RS-9 muffler on the 2017 Grom like they used for the 2014 – 2015 Grom. 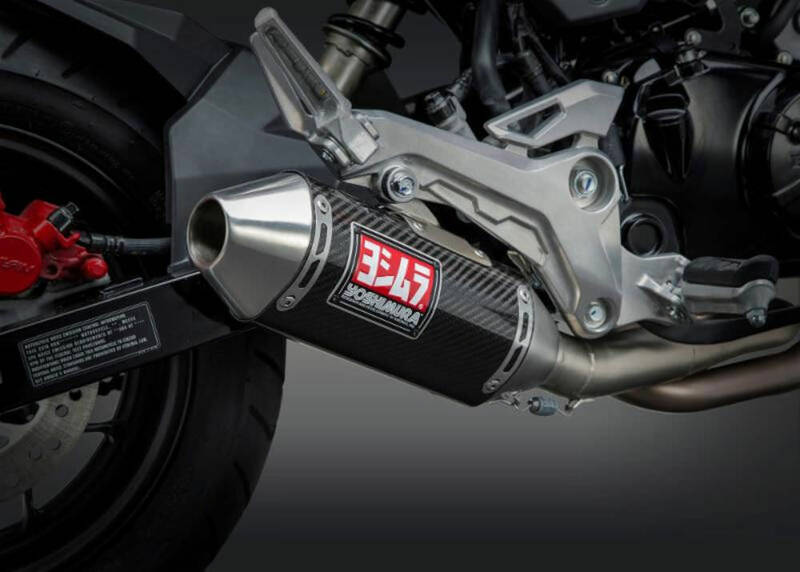 Yoshimura or “Yoshi” as so many call them, didn’t disappoint with their RS-2 Mini Race full-exhaust system for the 17′ Grom they just announced! Another little surprise though is that Yoshimura also has another exhaust available for the 2017 Grom that you’ll see below that is their R-77S exhaust system. 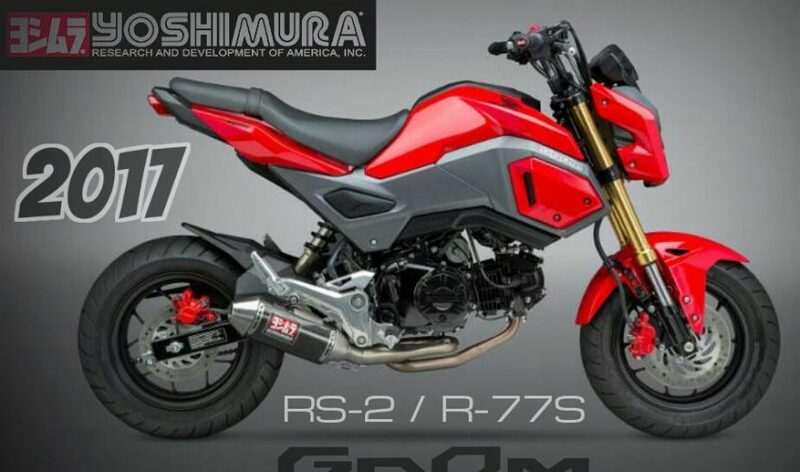 Technically, the Yoshimura R-77S isn’t “for sale” through distributors here in the USA so you’ll have to jump through a couple of hoops to get your hands on the Japanese spec R-77S for your Grom. 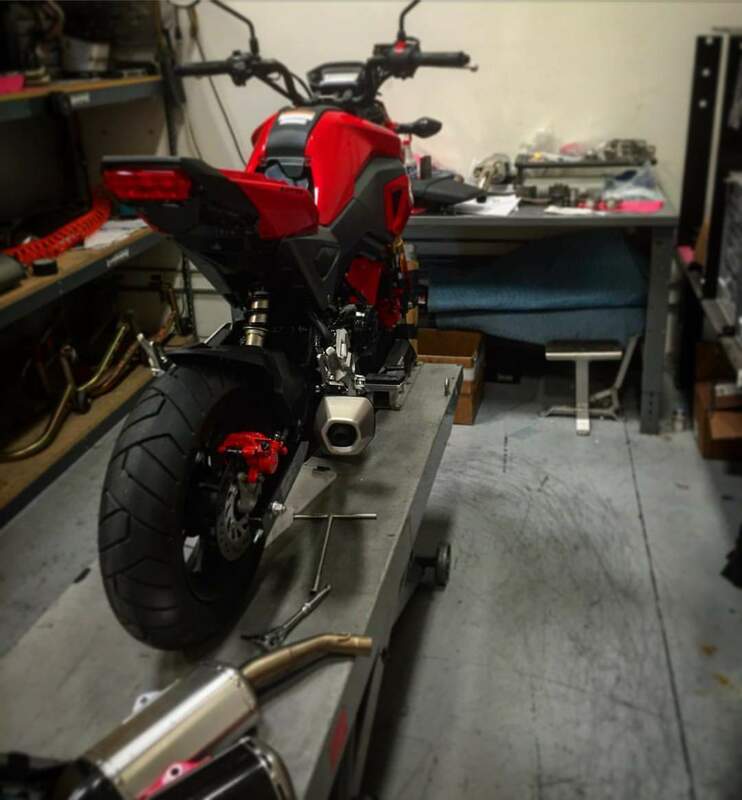 If you follow my blog, you will have seen I just posted an update with Tyga and their release of their new exhaust system for the 2017 Grom / 2016 MSX125SF that can be found by Clicking Here. 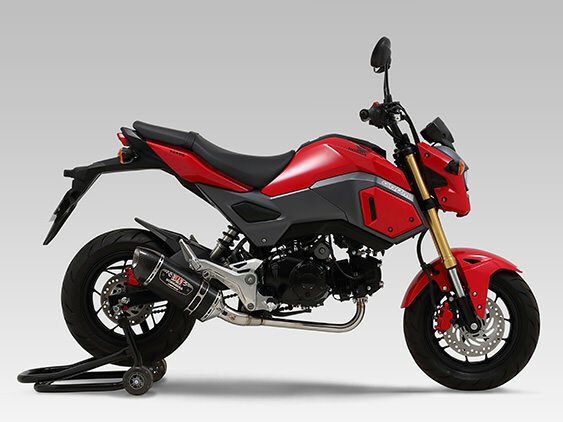 Not trying to get sidetracked with another brand exhaust for the new Grom but wanted to mention it just in case you’re shopping around for some of the best exhaust / muffler systems available at this time for the 17′ Grom. 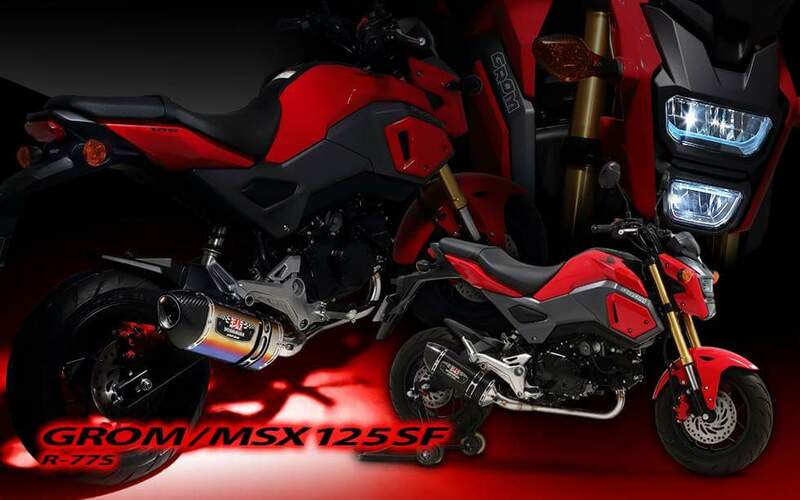 Yoshimura is bar none one of the better exhausts available for the Grom whether it be their old RS-9 style for the 2014 – 2015 Grom or the 2013 – 2015 MSX125. 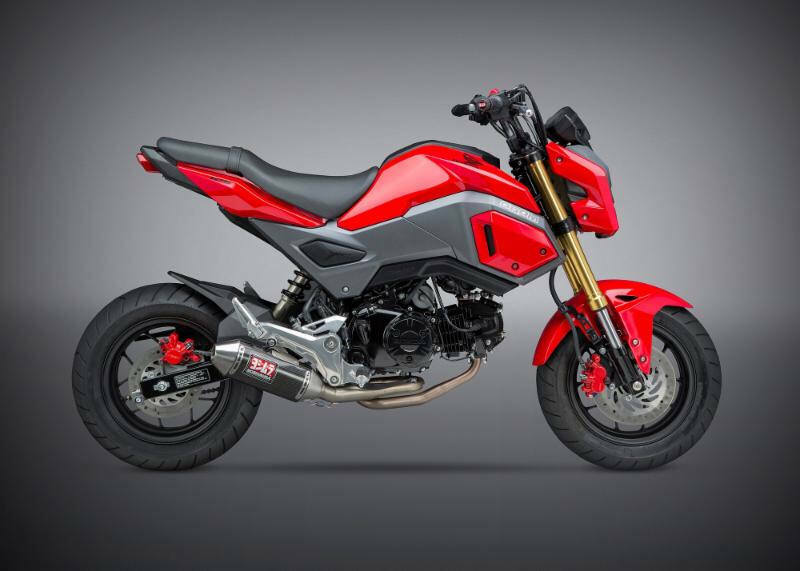 Of course sound and looks are hugely opinion based as everyone has different styles that they like and same with sound so when I mention “better exhausts available for the Grom”, I am referring to quality. We have had quite a few different brands have issues and problems with their exhausts for the Grom breaking etc due to the vibrations of a single-cylinder engine and them not designing mounts properly to combat those vibrations. If you browse the Grom owner’s forums you’ll find many examples of that happening. I won’t speak of any particular Grom exhaust problems except for the ones I’ve seen in person and I have seen first-hand a Compeition Werks Grom exhaust break (2 occassions) as well as a Two-Brothers exhaust system. I have yet to hear and or see of any problems with the Yoshi exhaust on the Grom and I have a few friends running their system here locally. Just so you know I’m not being biased when speaking of Yoshimura and their exhausts – personally, I don’t care for the design of the Yoshimura RS-9 for the 2014 – 2015 Grom but you can’t deny the quality behind them. 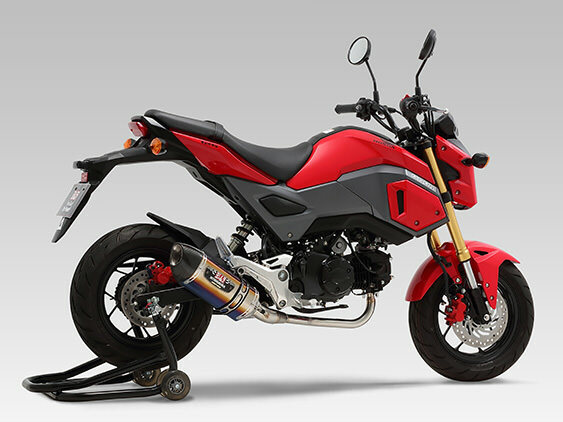 Yoshimura also released their Fender Eliminator Kit for the 2017 Grom (picture below) too with the roll-out of the RS-2 exhaust. I’ve got a picture of that Yoshi fender eliminator kit below too. 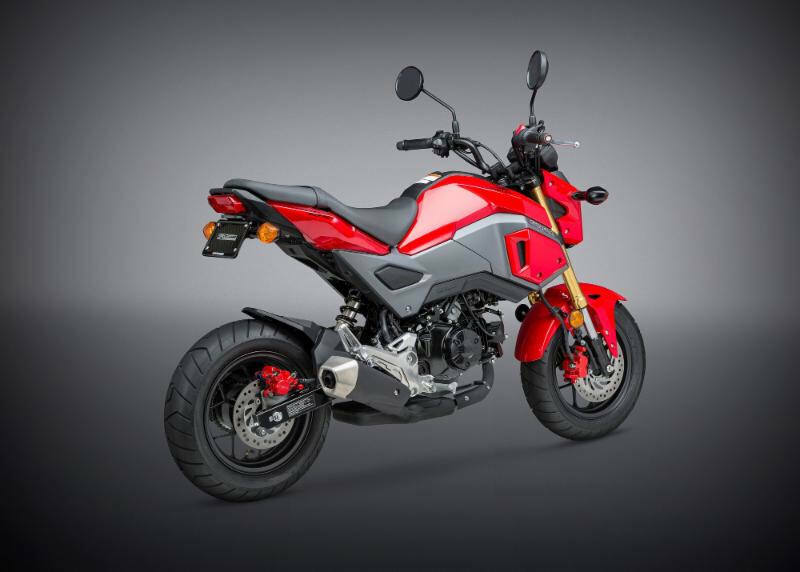 Not to be outdone, Honda strikes back with the brand-new 2017 version of the pint sized street fun bike the Grom (AKA MSX 125). Yoshimura is ready with a performance Race Series system that will make the little fuel injected 4-speed engine come alive! Gone is the weight of that ugly muffler box, so Yoshimura performance can be bolted up! Fresh off the dyno and out of the fixtures is our proven carbon fiber RS-2 mini system that adds torque, horsepower and less weight. Adorned with our proprietary Works Finish on the systems tubing that will give it that Ti look that’s guaranteed to increase head turns by 100%. 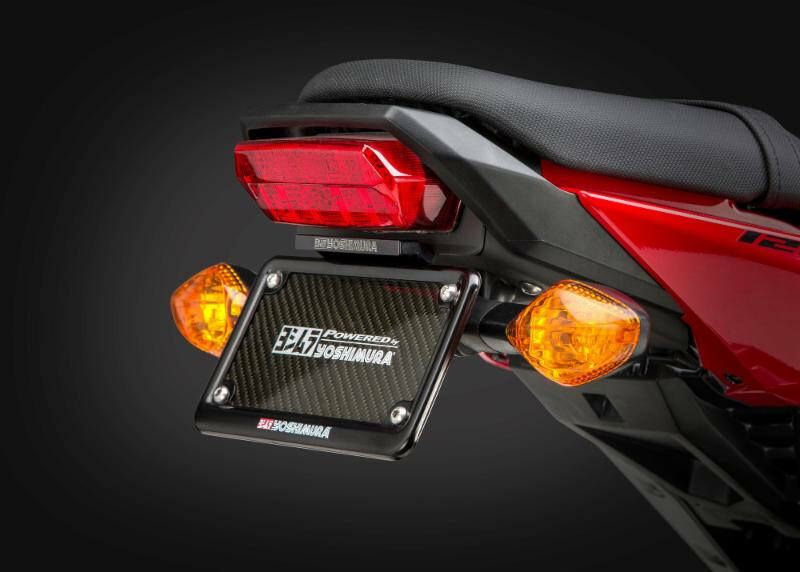 Add the new Yoshimura Fender Eliminator Kit and you can’t go wrong! Soon to be confirmed is Yoshimura’s 2017 Grom camshaft, engine plugs and graphics kit for this mini racer. Look for the release very soon! Here’s a video of the Yoshimura RS-9 exhaust on a friend’s Honda Grom to give you an idea of its sound. Keep in mind this is the Yoshi RS-9 on the 1st generation Grom that’s technically a high-mount muffler and not the low-mount like the RS-2 on the 2017 Grom. The sound should be very similar though, once I have a video of the 2017 Grom Yoshimura exhaust to post up I’ll edit this post and add it here. Now, if you’re curious about the other Yoshi exhaust I mentioned at the beginning of the article that is offered on the other side of the pond. This is the Yoshimura R-77S exhaust for the 2017 Grom (2016 MSX125SF)… As you can see the R-77S has a different header than the RS-2 that runs straight back to the low-mount muffler on the Grom / MSX instead of twirling around etc. It also has a different muffler design and is also offered in more materials including SS, CF and Titanium as well as the burnt blue’ish Titanium which is pretty cool. Want to buy the Yoshimura R-77S for yiur 2017 Honda Grom but having problems finding a dealer in the USA that carries it? 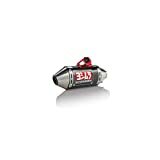 Your best friend in this case can be eBay with the links below. This particular link is for the Titanium R-77S but the same seller carries the Carbon Fiber and SS versions too. * What is the MSX 125 that I mentioned a few times above? 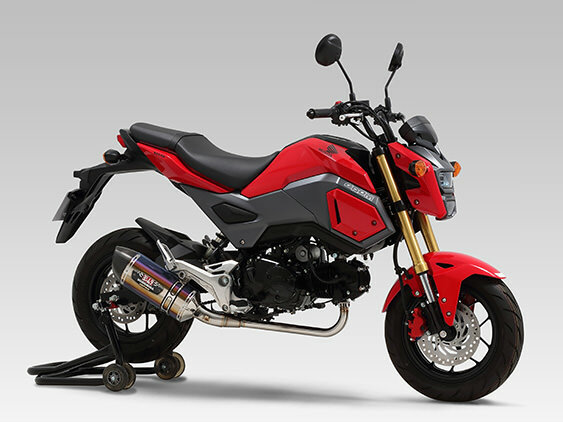 Some aren’t familiar with that model name but the MSX is technically what the Grom is called in other parts of the world. It’s identical to the T from the front to back except for the shape of their turn signals and then their headlight was different internally on the 2013 – 2015 model when compared to our 2014 – 2015 in the USA.